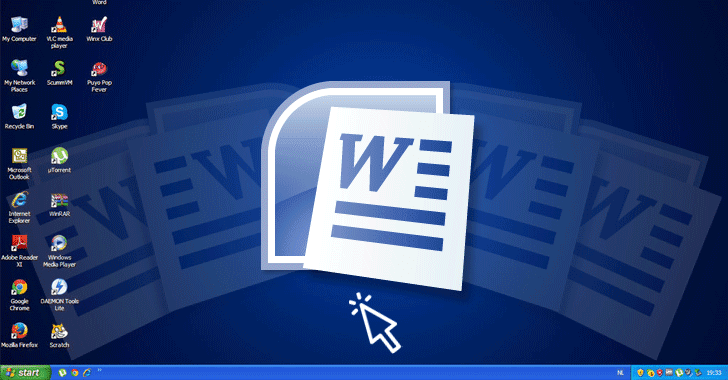 Lino Antonio Buono, an Italian security researcher who works at InTheCyber, reported a simple technique (detailed below) that could allow anyone to bypass the security control put in place by Microsoft and create self-replicating malware hidden behind innocent-looking MS Word documents. What's Worse? Microsoft refused to consider this issue a security loophole when contacted by the researcher in October this year, saying it's a feature intended to work this way only—just like MS Office DDE feature, which is now actively being used by hackers. Just yesterday, Trend Micro published a report on a new piece of macro-based self-replicating ransomware, dubbed "qkG," which exploits exactly the same MS office feature that Buono described to our team. Trend Micro researchers spotted qkG ransomware samples on VirusTotal uploaded by someone from Vietnam, and they said this ransomware looks "more of an experimental project or a proof of concept (PoC) rather than a malware actively used in the wild." It should be noted that the above-mentioned Bitcoin address hasn't received any payment yet, which apparently means that this ransomware has not yet been used to target people. Moreover, this ransomware is currently using the same hard-coded password: "I’m QkG@PTM17! by TNA@MHT-TT2" that unlocks affected files. If you are unaware, Microsoft has disabled external (or untrusted) macros by default and to restrict default programmatic access to Office VBA project object model, it also offers users to manually enable "Trust access to the VBA project object model," whenever required. 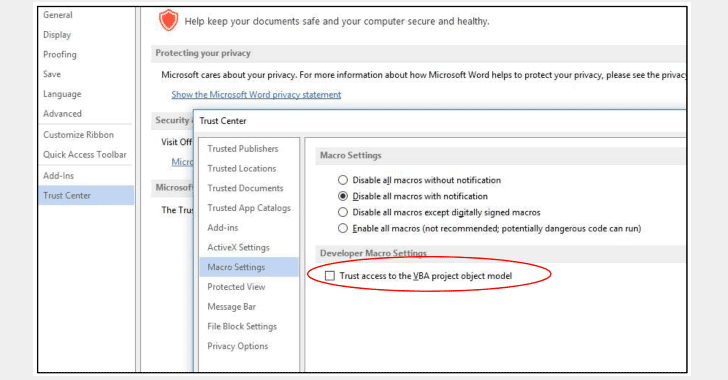 With "Trust access to the VBA project object model" setting enabled, MS Office trusts all macros and automatically runs any code without showing security warning or requiring user's permission. Buono found that this setting can be enabled/disabled just by editing a Windows registry, eventually enabling the macros to write more macros without user's consent and knowledge. Buono suggests "In order to (partially) mitigate the vulnerability it is possible to move the AccessVBOM registry key from the HKCU hive to the HKLM, making it editable only by the system administrator."